For sane, rational people, the C7 Corvette Z06 offers more than enough performance right out of the box. Chevrolet’s current top-spec sports car rolls out of the Bowling Green assembly plant boasting 650 horsepower and 650 lb-ft of torque from its supercharged 6.2-liter LT4 V8, enough grunt go toe-to-toe with the most capable exotics from around the world, many of which costing multitudes more. Chevrolet pegs the Corvette Z06’s straight-line performance at 3.2 seconds to get to 60 mph from a standstill when equipped with a manual gearbox (2.95 seconds with the automatic), and 11.2 seconds to complete the quarter mile (10.95 with the automatic). Actually achieving those numbers in the real world is a feat in and of itself, since all of that twist is all getting sent exclusively to rear wheels all too happy to go up in smoke if you’re a bit overzealous on the throttle. Does Callaway’s tuning make a great sports car even better, or is this a case study in the law of diminishing returns? We grabbed the keys to this manual-gearbox-equipped example while Pete Callaway wasn’t looking and embarked on a tire-melting discovery mission through the back roads around Los Angeles to find out purely in the name of science, of course. It’s easy to dismiss the SC757 as an exercise in excess. After all, adding 107 horsepower and 127 lb-ft to a car that already incinerates the rear tires should, by all logic, be a recipe for more of the same. But Callaway’s modifications to the Z06 prove to be more substantive than sheer horsepower one-upmanship, and much of it has to do with how that additional grunt is generated. Callaway’s testing shows that the Z06 SC757 is capable of sprinting to 60 mph in 2.8 seconds on its way to a quarter mile time of 10.5 seconds on stock rubber. This puts the SC757 Corvette roughly on par with a McLaren 675LT for straight-line pull a car which weighs less than 3000 pounds, has a dual-clutch transmission, and costs about $400,000. Speaking of additional options, this tester has a few. Callaway’s sport exhaust system is a low restriction design that does away with the factory dual-mode system in favor of a non-active system that’s tuned to eliminate cabin resonance while giving the SC757’s bark a little more character. While it didn’t sound dramatically different from the stock system in “loud” mode to us, we appreciated the improved sound at idle and low revs, and the lack of sudden jumps in volume that are all too common with the factory setup. Similarly, Callaway’s short throw shifter feels like a tangible improvement over the stock unit as well, eliminating the rubbery feel and reducing the fear of missed shifts particularly from second to third. The SC757 package starts at $17,995 and can be applied to a factory-stock Corvette Z06 from the current or previous model year. 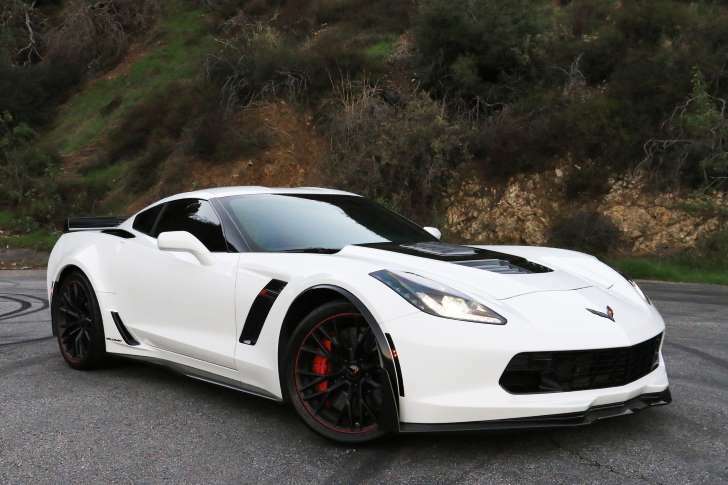 Alternatively, the package can be optioned onto a new Corvette Z06 when the car is ordered through one of the Chevrolet dealerships in Callaway’s network. It’s also important to note that Callaway’s package doesn’t void the existing GM warranty, and Callaway provides an additional three-year, 36,000 mile warranty of their own, which can optionally be extended to five years and 60,000 miles.